The conclusions of the Macpherson Inquiry (1999) into the Metropolitan Police Force’s handling of the racist murder of Stephen Lawrence rocked the British criminal justice system to the core. The Inquiry concluded that the Stephen Lawrence “investigation was marred by a combination of professional incompetence, institutional racism and a failure of leadership by seniors officers” (1). Stephen was murdered because of the colour of his skin and police failed him… because of the colour of his skin. I have followed the Lawrence family’s campaign intently and have written about it in my book as the same failings marred the Royal Ulster Constabulary’s (RUC) so-called investigation into the death of my grandmother and 14 other civilians – women, men and children – in the McGurk’s Bar massacre of 4th December 1971. Our loved ones were murdered by British extremists because of their faith and the police failed them… because of their faith. We have never received a fair and just investigation even after two generations. I, like many other family campaigners, have also drawn great strength from the Lawrence family’s fortitude as they faced – just as we do – a monolith of State intransigence and lies. They have overcome them. So there is hope. Nevertheless, news that the Met Police stooped even lower than they had admitted to the Macpherson Inquiry has horrified many, including the Lawrence family themselves. A former undercover cop has alleged that he was ordered by his police superiors to dig the dirt on the Lawrence family in a wider attempt to smear their good name and their campaign. The Met’s Police Commissioner, the British Home Secretary and the British Prime Minister have been tripping over themselves – and rightly so too – to promise the family and the voting public that they will investigate the allegations thoroughly. It appears that the police have been acting outside the constraints of the law and have undermined Macpherson’s public inquiry. Humanity, ethics and morality are nowhere to be seen. Horrific as this may be to imagine that the police could do this, it does not surprise our families. Nor would it surprise the family of Daniel Morgan or families who lost loved ones in the Hillsborough disaster. What has horrified me, though, is that we proved long ago that the police and the State smeared our loved ones and yet my peers are still fighting for even a scrap of support from the authorities. We know this as we had to find and publish their own files without their help. 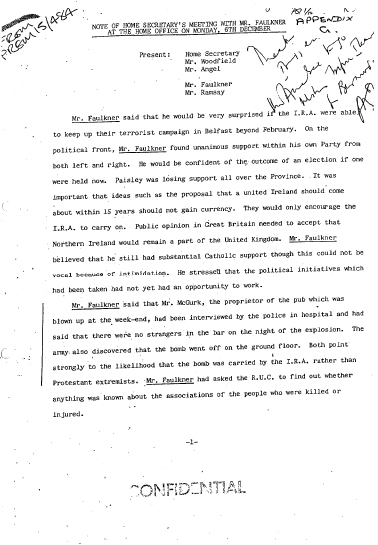 Hours after the McGurk’s Bar massacre, the General Officer Commanding the British Army in Northern Ireland was informed that the bomb had been “placed outside” the bar – in other words, attacked by pro-State Loyalists. Nevertheless, the RUC placed it on file and informed the media that it was a Republican own-goal so our family members were at the very least guilty by association if not complicit in their own death. In effect, the RUC criminalized innocent civilians even before all of the dead – including my own grandmother – had been identified. The day after the RUC did this, the Northern Ireland Prime Minister traveled to London and told the British Home Secretary the same lies. 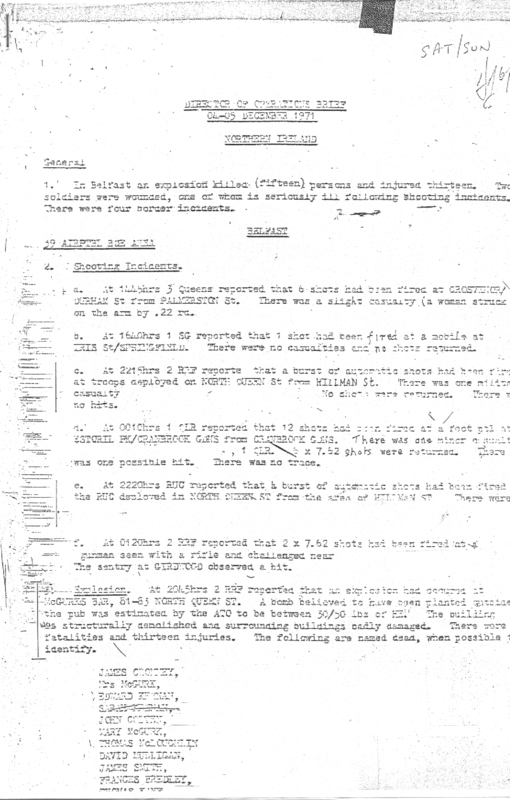 He also told the Home Secretary that he had instructed the RUC to “find out whether anything was known about the associations of the people who were killed or injured.” This is a stark admission of political interference at the highest levels in a live investigation and that the police had been ordered to dig the dirt on innocent victims. Just over a week later the Chief Constable of the RUC stood in front of a Joint Security Committee meeting in Stormont and told the same General Officer Commanding and the same Northern Ireland Prime Minister that “two of those killed were known IRA members, at least one of whom had been associated with bombing activities” (2). The police’s pretext for the bomb and their defamation of innocent civilians were complete and utter lies but they suited the RUC’s agenda. No present day investigation has found a single shard of evidence to support the actions of the RUC at this time. Nevertheless, we are forced to continue our campaign for truth over 41 years later even though we have proved that the police criminalized our innocent family members. 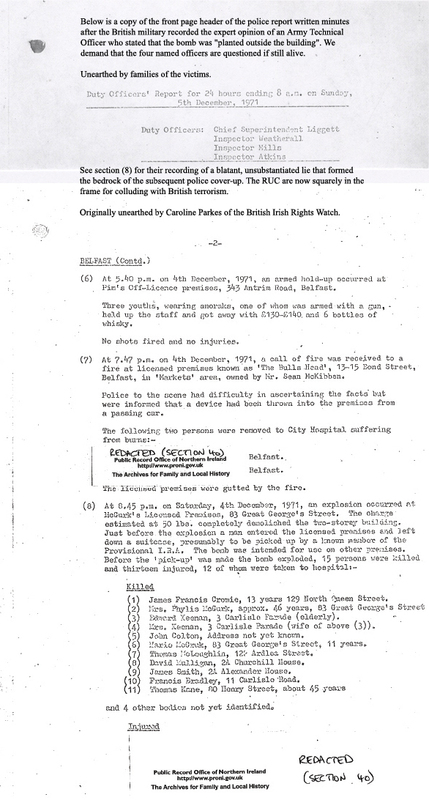 In fact, the present Chief Constable of the Police Service of Northern Ireland – the so-called reformed police service – has denied that the RUC was wrong in its investigation into the McGurk’s Bar bombing but is trying to bury – we can only assume – a third report made by his officers in the Historical Enquiries Team. Is it because we are Irish Catholics that we are being treated like this still? Or is it that the police are a law unto themselves? (2) I discovered this file in public records but, before it was handed to me, a National Security bar was placed on it so I have been denied access to it. Nevertheless, I was able to direct the Police Ombudsman and Historical Inquiries Team to its contents. This has since proved crucial to proving that the RUC willfully told lies to Government.